Spacious and Luxurious Skyland Home! Welcome to Club Cottage! Located right next to the Country Club and across from the award winning Robert Trent Jones course this almost 3,000 square foot home couldn't be better equipped to host your next family vacation. Only 2 miles from the town of Crested Butte and less than a 10 minute drive to the ski resort this home is uniquely positioned to enjoy the beautiful views at night but only minutes from all the best shopping and dining. If you love golf then the private course across from the home opens up to the public at noon on each day. Pull into the oversized garage and begin your vacation at luxurious Club Cottage. Entering the home you immediately realize the care that went into the interior design to make your home away from home enjoyable during your stay. On the main level of the home you will find the great room with vaulted ceilings and huge picture windows to take in the views of the surrounding mountains and the neighboring golf course. Cozy up to the gas fireplace, have a morning cup of coffee on the deck, or whip up a family dinner in the fully stocked kitchen while everyone gathers around the dining table! There is a powder bath on this level as well as the master retreat. With a king sized bed, gas fireplace, and french doors leading out to a small deck, you may not want to leave this room. If you do it may just be a short trip to the master bath with oversized jetted tub and glass shower. With dual vanities there won't be any fighting over the mirror in the mornings! Upstairs you will find a great loft area for kids with bunks consisting of a double bed on bottom and twin on top, as well as a twin trundle and sitting area with TV for games. The lower level of the home has the entrance to the garage, the laundry with full size washer and dryer,and two additional guest rooms each with their own bath. The first guest room has a queen bed with en-suite bath and the second guest room has a set of twins with en-suite bath. 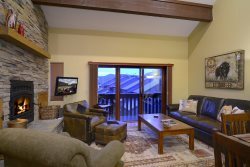 Whatever the season, Club Cottage is sure to be your go-to vacation destination in Crested Butte! Give us a call today and book your piece of paradise! *Due to rules passed by the Skyland Home Owner's Association, no trailers, boats, or recreational vehicles are allowed to park in the driveway of this home. A small trailer can be unhooked and kept inside the garage with the door shut, but other arrangements must be made for additional trailers and boats. One guest car can be kept in the garage and there are 2 driveway spots available.